If you are a fan of pecan pie, and pumpkin let me just say this white chocolate pumpkin cheesecake with a pecan pie crust is going to knock your socks off! It’s seriously the best of both worlds! In years past I have gone all out on get togethers. I’ve been a stressed out mess trying to ensure that everything is perfect, living in my kitchen days prior to the big event. Not this Year! I have a new motto K.I.S.S. Keep It Simple Stupid, thats right! Stop making things so complicated. White chocolate pumpkin cheesecake with a pecan pie crust is the perfect solution to a quick, and easy dessert. Did I mention it gets better? Thats right no oven/baking required! (unless you want to). I adapted this from Food.com and simplified the recipe. Seriously 6 Tbls butter? just throw in the whole stick! 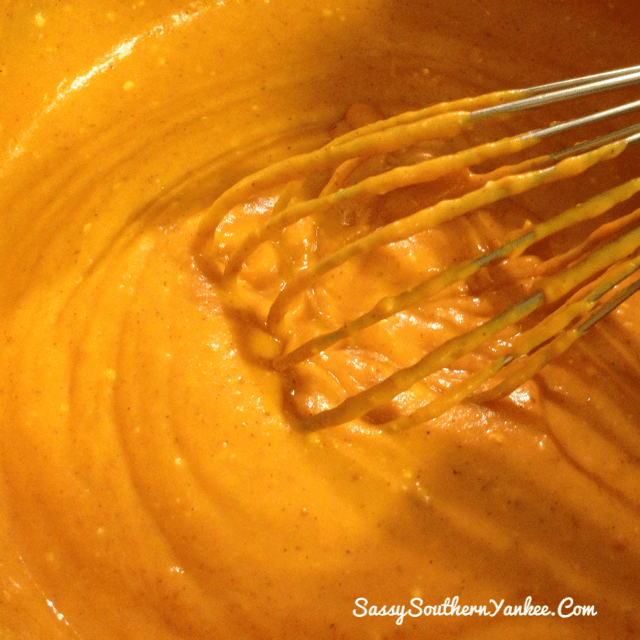 Why wouldn’t I just use the whole can of pumpkin? What am I going to do with 1 oz of leftover pumpkin? Don’t worry I have made this so easy even those of those of you who never set foot in the kitchen will become dessert masters! * For those of you who are gluten free or have someone in you life that is White Chocolate Pumpkin Cheesecake with a Pecan Pie Crust naturally gluten free. 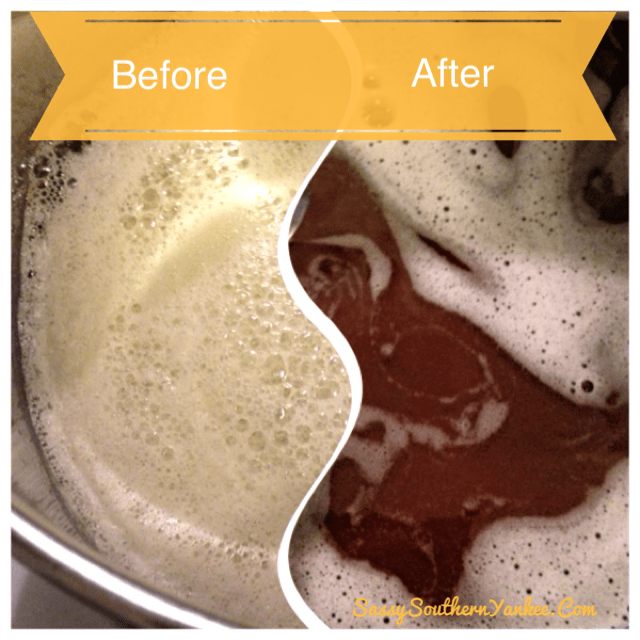 In a small sauce pan, over medium meat melt butter and cook until it starts to brown. Careful not to burn it, you need to keep swirling the pan over the heat. I always know its done when it starts to smell like a perfectly cooked grilled cheese LOL. If you want to bring out a richer flavor in the pecans pop them on a cookie sheet, and bake in the oven at 350* for about 10 min. If you don’t have the time of just don’t care to have the oven on then pop them right into your food processor. 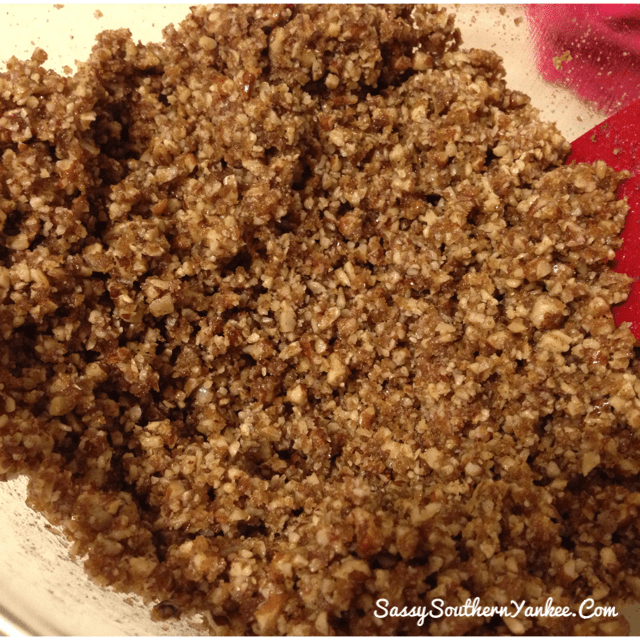 In your food processor pulse pecans until they are finely chopped. Add in sugar, salt and browned butter. Pulse a few times until it comes together. (If you don’t have a food processor no worries, just finely chop the nuts and stir everything together in a bowl). Press crust into the bottoms of your favorite tartlet pans or a 9-10 inch tart/pie plate. I use the bottom of the measuring cup to help press the crust down firmly. **Reserve just a bit to sprinkle over the top of your finished dessert. Place in the freezer until you are ready to fill. In a medium sauce pan add all of your filling ingredients and whisk constantly over medium heat until everything has melted and it is smooth. You can also do this in a microwave safe bowl heating on high for 1 min at a time and stirring in between (if you use the microwave place a piece of paper towel over the top of the bowl as the pumpkin tends to splatter). Pour into prepared crusts or crust. Refrigerate a minimum of 3 hours and serve. 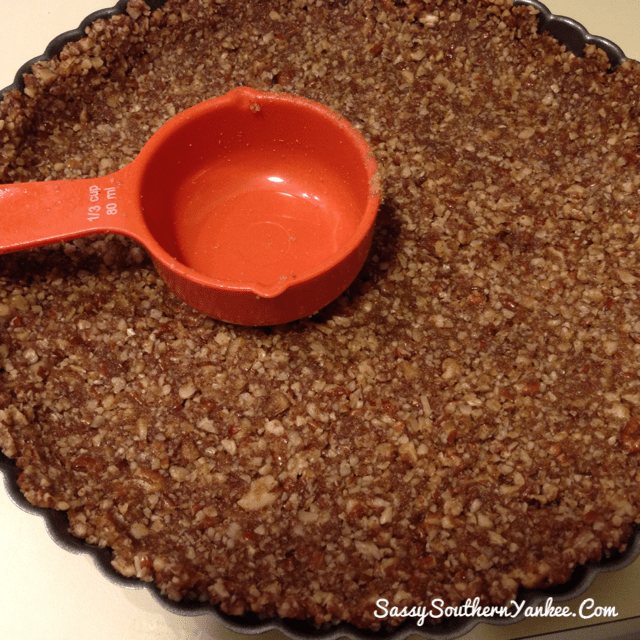 Sprinkle extra pecan pie crust over the top the tart before serving. 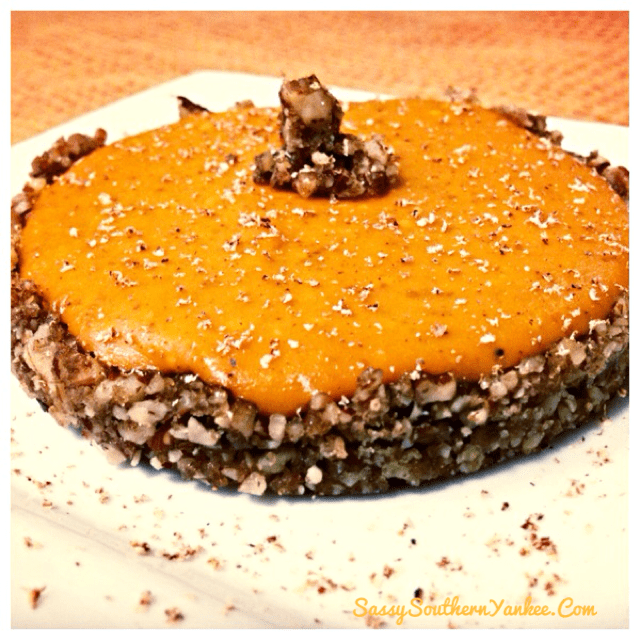 This entry was posted in Dessert and tagged Cheesecake, Dessert, Gluten Free, No Bake, Pecan Pie, Pumpkin, White Chocolate, White Chocolate Pumpkin Cheesecake with a Pecan Pie Crust.